Haha... well, in a nutshell, that's really what I took away from the experience of eating them (some 4 pieces). 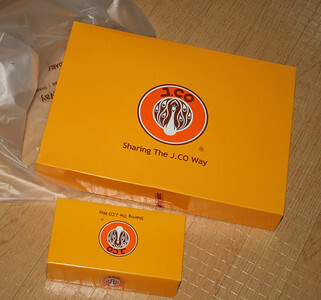 Hubby told me about how he has been reading about J. Co Donuts & Coffee and that we should at least try them. So, in a date at MOA, we decided to brave the lines that reach up to the nearby entrance to SM Hypermart. It took us an hour to reach the counter (and this is on a weekday, just before office hours end) and get donuts. The donuts were good. I really wouldn't say great. I like that they weren't sickeningly sweet, but the dough was so light and soft, it felt a little like cake. I missed that slightly crisped texture and most also lacked that cinnamon-y (?) flavor one associates with doughnuts. The Alcapone (two at right most, the one topped with almonds) was my favorite... I liked the light crunch it offered. The white donuts with piped chocolate (second from left, top) is the Why Nut and is filled with pure peanut butter sans sugar, so again, not too sweet, but I like my peanut butter a little sweet. 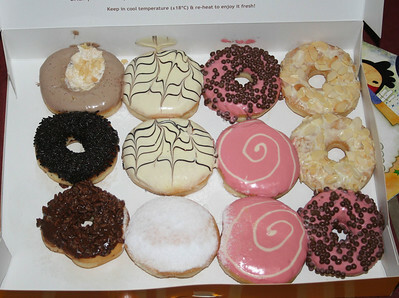 The Snow White (second from left, bottom) is filled with cream. The Heaven Berry (pink with white swirl) is filled with strawberry cream. Hubs order 2 extra ones because the counter only had about 9 varieties to choose from when he ordered the dozen... and then these two flavors became available. Meet Mr. Green Tea and JCrown Oreo. If you check the J. Co Donut & Coffee Facebook page, you'll see some supposedly 30 variants offered in the Philippines... but right now, with all the hype for this new treat, good luck if you can choose from among 10. Plus, if you'll notice, the donuts here do not look pleasing because of the demand for it... the staff can barely whip them out. Will I buy them again? Sure... but I won't definitely line up that long for them again. I can wait for all the hype to die down. And, though I really enjoyed them, I can't say I enjoyed them enough for me to crave for them again. Maybe because I have a sweet tooth?